This program is a stand alone program that will teach you Amharic in a different way. 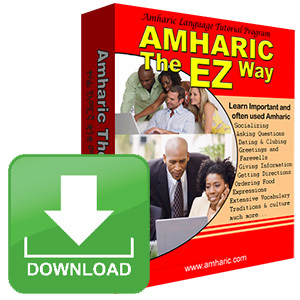 Where as Amharic 101-104 teach you Amharic in great detail and depth, Amharic The EZ Way will teach you over two thousand important and often used Amharic phrases and words. It is a very simple and straight to the point program. You will start conversating in Amharic in a very short time. It also has a number of games and quizzes to test and reinforce what you have learned. 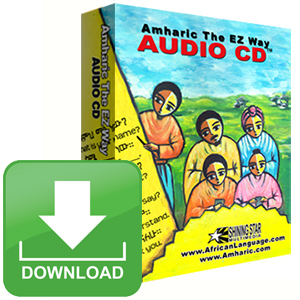 If you purchase the package deal, then you will also get four audio cds and 100 flash cards so that you can study Amharic when you are not at your computer. For those that want to practice reading Amharic, an Amharic translation is displayed. 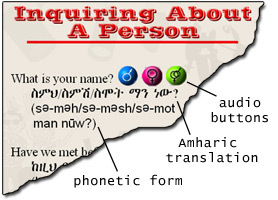 An audio button: click on this buttons to hear the clear voice of a native Amharic speaker read out loud the Amharic translation of the phrase. The blue button is when referring to an informal male person, the pink button is when referring to an informal female person, and the green button is when referring to a formal person of both genders. This program will teach over two thousand important and often used phrases. You will know what to say in Amharic when you are at the airport, hotel, bank, hospital, restaurant or when you are out on the town, when meeting people, in stores when shopping, on the phone, or any where you happen to go. Learn the Amharic alphabet using direct audio clips. Once you learn a phrase, you can record yourself by clicking on the ‘Record’ button and compare your accent or pronunciation to a native Amharic speaker. There are fun and simple games that are based on the lessons found in this program. This will help reinforce all that we have learned. You will be timed and scored on your performance so that you can continuously challenge yourself to do better. This is a proven and fun way of learning any foreign language. Last but not least, there are quizzes that will test your skill before you move on to the next level. There are multiple choice, matching, true/false, fill in the blank type quizzes. You will be graded at the end of each quiz. A certificate with your grade can be printed out so that you can keep track of your improvement.